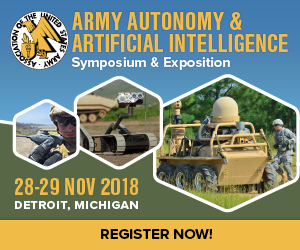 The 2018 AUSA Army Autonomy and AI Symposium & Exposition will take place at the COBO Center in Detroit, Michigan, November 28-29. This event will explore and showcase innovative ways the U.S. Army is developing critical capabilities in robotics, autonomy, machine learning, and artificial intelligence. The 2018 AUSA Army Autonomy and AI Symposium & Exposition will take place at the COBO Center in Detroit, Michigan, November 28-29. This event will explore and showcase innovative ways the U.S. Army is developing critical capabilities in robotics, autonomy, machine learning, and artificial intelligence.